Milk Tray may suggest otherwise. However͵ just a tip͵ I can guarantee that purchasing this for your female better half may result in the opposite desired effect͵ unless of course͵ the ultimate aim is just that and requiring ownership rights of the hind legs of a Jack Russell and that taking up residency with the garden furniture in a Wendy house seems appealing... This is your gift!!! 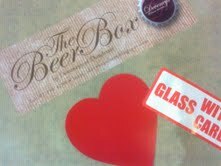 The Beer Box is all about love for February. It's the usual drill͵ a 12 bottle box (Valentine themed)͵ a glass and a love snack͵ delivered to your door͵anywhere in Ireland (R.O.I) for €50.00.